It was time here at My Recycled Bags to crochet a new recycled plastic bag project. I needed a basket for the local nursing home fundraiser so out came my green plastic bags that I have been collecting. I cut my bags into 1 inch strips and assembled a ball of plarn to begin my recycled plastic basket. 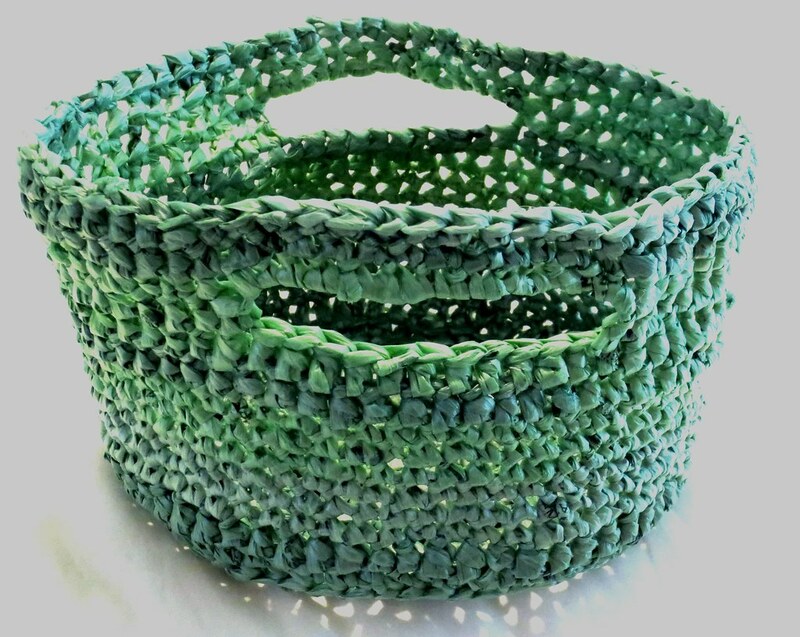 I used this free recycled plastic basket pattern to crochet my basket with a K crochet hook. I did a modified version of the basket pattern by crocheting less rounds so it was shorter. My finished size is 5 inches tall, 22 inches around and about 7 inches across top. Most of the green bags matched but some were a shade darker and lighter. As you can see, these different shades of green give the basket a cool blended color look.